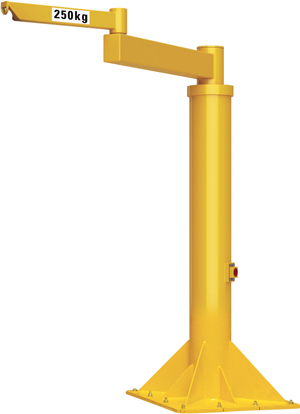 Standard height under upper lifting hook = 3m, adjustable higher or lower, accordingly modifying overall height measurement; for a height under upper lifting hook higher than 4m, contact us. Articulated pillar jib crane for indoor use, 350° rotation for arm 1 and 300° rotation for arm 2. This type of jib crane cannot be motorized. The Maximum Moment (MM) is given as a rough guide and under nominal load. Base plate for chemical anchors.